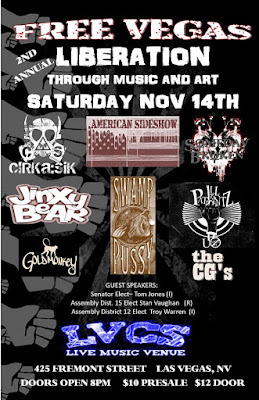 The Second Annual "Liberation through Music and Art", IN TUNE PRODUCTIONS, will be coming to Las Vegas Saturday, November 14th and will be hosted at the Las Vegas Country Saloon on Fremont Street. It all started a year ago, when the owners of In Tune Productions, a successful music production company, desired to promote a concert with meaning and purpose. The owners, Justin and Paula Pimentel, have a great passion for music and have been promoting concerts for 12 years. They say "Las Vegas has always been one of their favorite places to host events”, and so they come back every year. Recently, they both have become concerned with the direction America is heading and decided to involve an educational aspect to their shows; thus, the creation of "Liberation Through Music and Art" came to be. 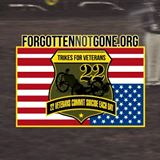 Now along with epic live music and artistic vendors, their events also include guest speakers ‘ presentations on subjects such as Chemtrails', 2nd Amendment preservation, Agenda 21, Government corruption, natural healing, and the importance of family unity. "Liberation Through Music and Art" tours all year throughout the west from Washington and Oregon to California and Nevada. Their plan is to grow the event each year so they can continue to spread their messages to the masses while doing what they love most "MUSIC." I am so excited to see this event return to Vegas. I attended last year's and the music and dedication to the freedoms of this country were equally as awesome as the music! You won't want to miss this, folks!! !